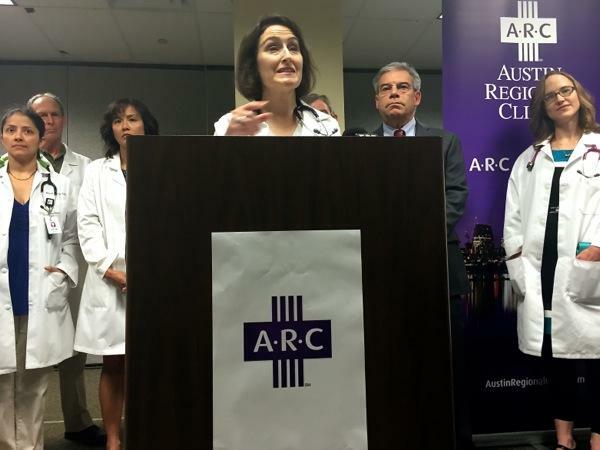 Dr. Alison Ziari with the Austin Regional Clinic announces the company's new policy requiring pediatric patients to get immunized on June 30, 2015. Allison Rogers is one of the parents who is now exempting her children from a number of vaccines. Her oldest son has autism. She has two younger sons and is pregnant with her fourth child. They live about 20 miles outside of Central Austin and from here, the easiest doctor’s office to get to is a branch of the Austin Regional Clinic, or ARC. The company has 70 pediatricians, who care for about a third of the pediatric patients in the region, but they’re about to lose some patients. "Unfortunately I think that a lot of the patients that need protecting are the ones they’re now driving away," Rogers says as we talk outside her home, while her two younger songs play outside. On June 30, 2015, ARC announced it will no longer accept new pediatric patients who aren’t getting fully vaccinated. That means Rogers’ children will no longer be getting care there. "We are very worried that we’re putting our vulnerable patients at risk," said Alison Ziari, a pediatrician with ARC. 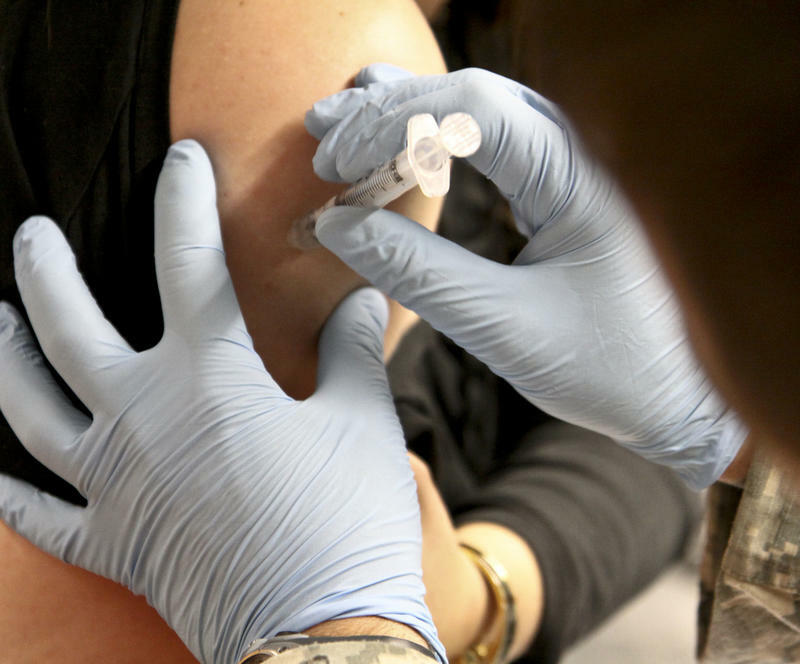 In Travis County, for example, the percentage of children who aren’t fully vaccinated has gone up from 0.66 percent in 2007-2008 to 1.75 percent in 2013-2014, according to the Texas Department of State Health Services. "Because of this experience that we’re starting to see the numbers creep up and because of the situation with the measles outbreak, we knew we really had to take a stand to protect our patients." Last year, 10 cases of measles were reported in Texas. In 2013, 27 cases were reported to the Texas Department of State Health Services, the highest count the agency had seen in more than 20 years. 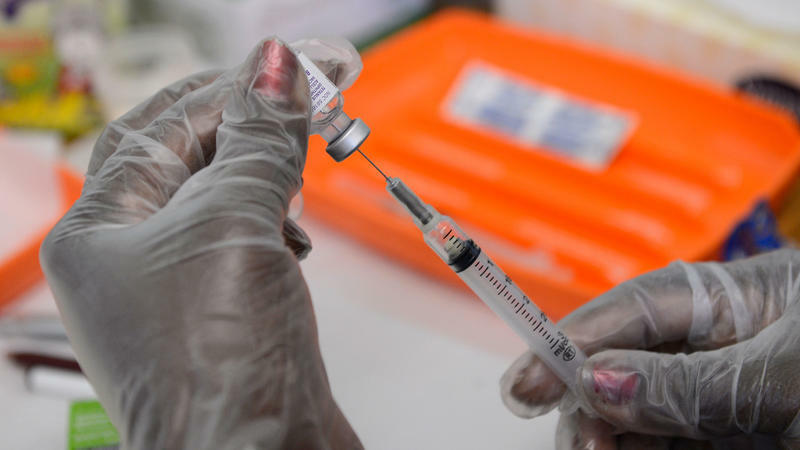 Last week, the death of an elderly, unvaccinated Washington woman was the first U.S. death attributed to measles since 2003. While there is broad consensus in the scientific community that vaccines are safe, some parents, like Allison Rogers, believe some vaccines harm children, like her own. "I didn’t arrive to this position in a very comfortable way," Rogers says. "I truly believe that I have a vaccine-injured child, and I truly believe that if I had continued to vaccinate my second son, he would have more severe developmental issues than he does." Physicians, however, say when they took the oath to do no harm, it means they must provide a safe environment for all their patients. Dr. Jason Terk is a pediatrician in Keller, Texas, with the Cook Children’s Health Care System, which also requires vaccinations, and he's also the current president of the Texas Pediatric Society. "If we host an increased risk in our practices by allowing non-vaccinating patients to co-mingle with cancer patients and newborns, then that is within our control and which we’d potentially feel responsible for," Terk says. Terk's contacts across the state and the U.S. are increasingly requiring patients to get immunized, he adds, because of diseases like measles. "We’re talking about a disease which is exquisitely contagious," he explains. 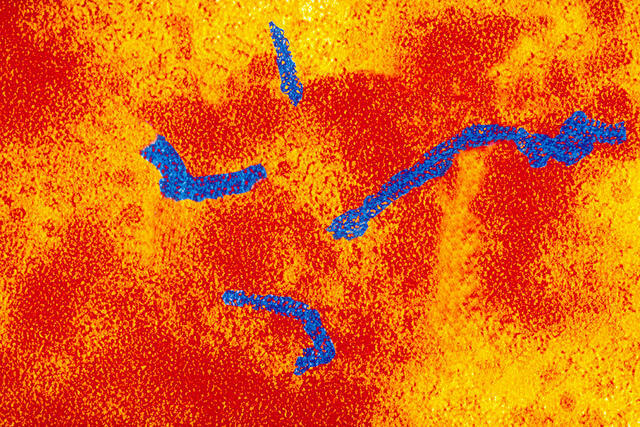 Measles can stay in the air for up to two hours. A doctor’s waiting room can make for a much more contagious environment than an open-air park like Disneyland, and for a health care system, taking that risk can cost a lot of money. "If you avoid being the next Disneyland – Disneyland suffered a huge PR hit by being labeled as the source of this infection, even though it wasn’t their fault," says Professor Steven Wallace, a professor at the UCLA Fielding School of Public Health. Wallace says the ARC decision makes economic sense and he expects others to follow suit, but clinics should do more than just push the problem down the road, he adds. They should consider what could motivate parents to stay. Allison Rogers says for her, that would be a tough sell. She’s reminded how much she’s against some vaccines every day. Like when her family can’t take their oldest son out in public, when they rarely see family members and when the chimes on the door wake her up at night because her son managed to leave the house unattended. "At some point, your personal interests for the well-being of your family don’t always align with society, and I think it’s really inappropriate for anyone to try and take that away for whatever reasoning," she says. State Rep. Jason Villalba, R-Dallas, says Texas can’t wait for an epidemic to happen before it changes its laws like California has done. 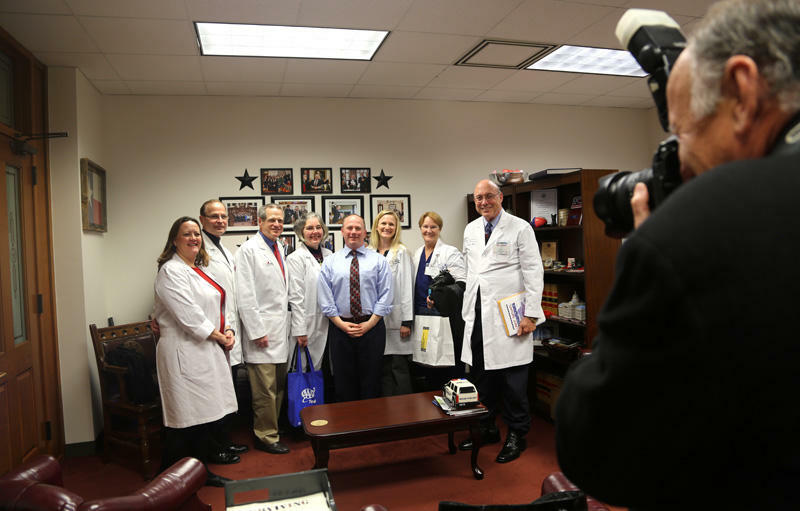 "Let’s take the action today so we aren’t on the front pages of the newspaper next year, when we do see an outbreak of diseases that have been eradicated all over the world reemerge in Texas," he says as a plea to fellow lawmakers. In the 2015 legislative session, Villalba drafted a bill similar to the legislation California signed into law last week. 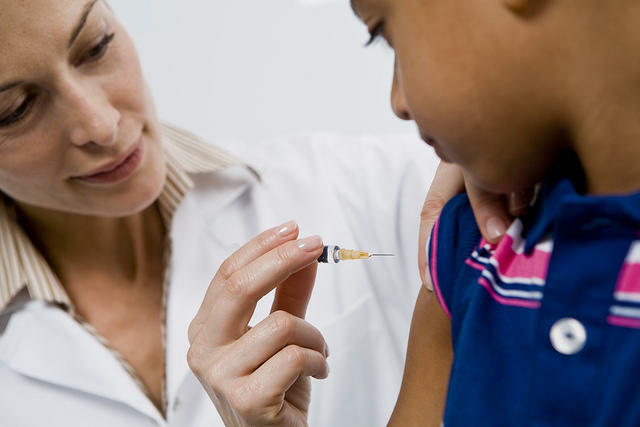 It would’ve prohibited parents from claiming philosophical or religious objections to immunizations required for their kids to go to school. His bill didn’t pass, but he’s hopeful data from California will help him renew his effort when lawmakers come back to Austin in 2017. With vaccines in the news the past couple months, you might have got to wondering about your own. Remember that card with a record of all of your shots on it? If you’re past your college days, it might’ve been a while since you’ve seen it – if you even have at all. If you didn’t tell your doctor at age 18 that you want Texas to keep that record electronically, chances are your records are gone, but some state lawmakers are trying to change that.